While emissions that affect air quality are released mostly during the day, there is still chemistry at night that determines how long certain pollutants stick around. This is particularly true for the chemistry of nitrogen oxides. NOX (NO and NO2) is emitted from a variety of sources, both natural and human caused. In the winter, the primary sources in this area are combustion-based: power plants, automobile engines and wood burning. When the sun goes down, NO2 (which forms predominantly during the day from the reaction of emitted NO and other atmospheric chemicals) builds up and reacts further to form compounds with more oxygens. The three compounds that determine overnight removal of NOX from the atmosphere are: N2O5, ClNO2 and HNO3. Each of these has different fates the next morning. N2O5 returns back to NOX, so we call it a “reservoir species.” ClNO2 will form NOX and a Cl atom. HNO3, on the other hand, usually gets removed from the atmosphere without undergoing further chemistry. 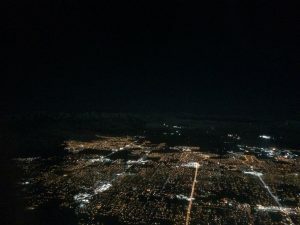 The balance between these different nighttime species is very important, as it determines how long NOX pollution persists in the atmosphere and, therefore, how far it is able to travel from its initial emission source. 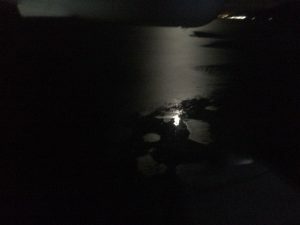 To investigate this overnight chemistry, we have to fly at all hours of the night. Since the plane has been repaired from its bird strike, we’ve been trying to characterize the nighttime chemistry of the area. We’ve taken off at midnight, 2 am, 6 am and other crazy times in an attempt to capture the full extent of what happens overnight. These flight times create unusual sleep schedules for both scientists and pilots and require some finagling to fit in pilot rest requirements. 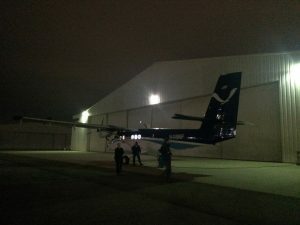 When we have a 2 am takeoff, the scientists need to be at the hangar at 11 pm for preflight, while the pilots show up at 12:30 to make sure the plane is ready to go. While our sleep schedule gets disrupted and flying altitudes are more limited, there are some awesome aspects to night flying. Aside from the science, which has been very interesting at night, we’ve seen the moon reflect off the Great Salt Lake at 11 pm and we’ve watched the sun rise over the Wasatch Mountains in the early morning. 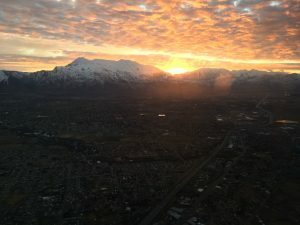 While it may be 7 am and everyone on the plane has been up through a long night, seeing the sun peek out between the mountains and watching the atmospheric chemistry transition back to its usual daytime makeup is always worthwhile. It turns out the night schedule was useful in other ways as well. When two of us drove the U-Haul back to Boulder with the equipment, through a series of unplanned incidents, we wound up returning at 3:30 am. After all those night flights, we were well prepared for a night of driving!